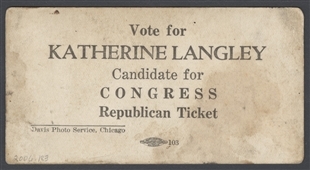 Katherine Langley launched her first campaign—for which this card was created—under unusual circumstances. 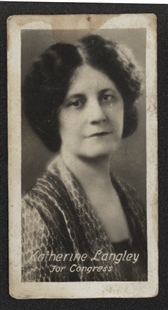 Her husband, Representative John Langley, resigned his seat after being convicted of violating Prohibition laws. Katherine Langley set out to defeat his successor in a “vindication campaign,” with the intent of exonerating her disgraced spouse. News articles extolled her, remarking on the many miles she travelled on horseback to make speeches in the 10 rugged mountain counties of her Kentucky district. 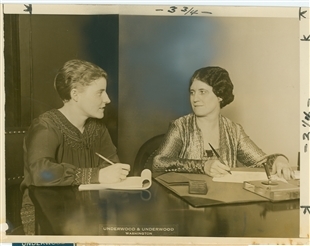 As the only new woman in the 70th Congress, Langley brought the total count of women in the House to a historic high of four.